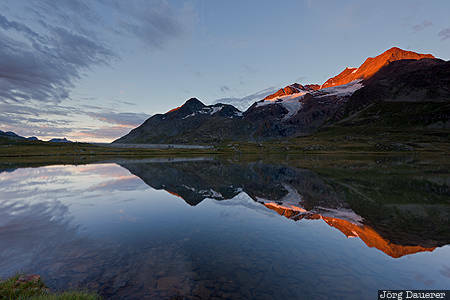 Alpenglow on the peak of Sassal Mason in the Bernina Range illuminated by the first light of the day and its reflexion in the calm water of Lej Nair (black lake). Lej Nair is near Bernina Pass in Canton Grisons (Graubünden) in Switzerland. This photo was taken in the morning of a sunny day in August of 2016. This photo was taken with a digital camera.